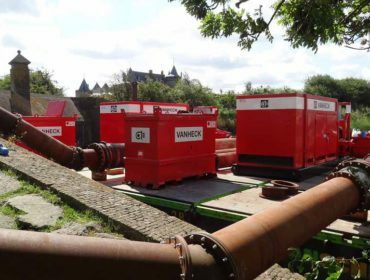 At the Medieval defensive stronghold of the Muider Castle two silenced diesel driven HK500 pumps were installed on a pontoon. 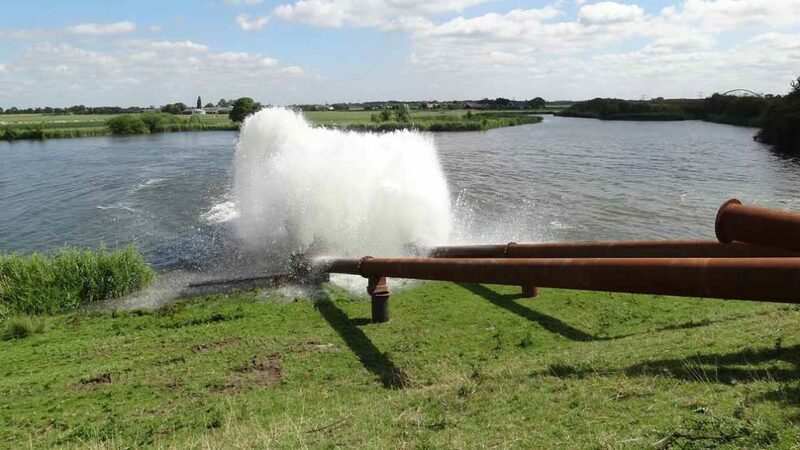 With this, over 8,000 m3 / hour can be pumped over the dike and diverted to the Vecht. 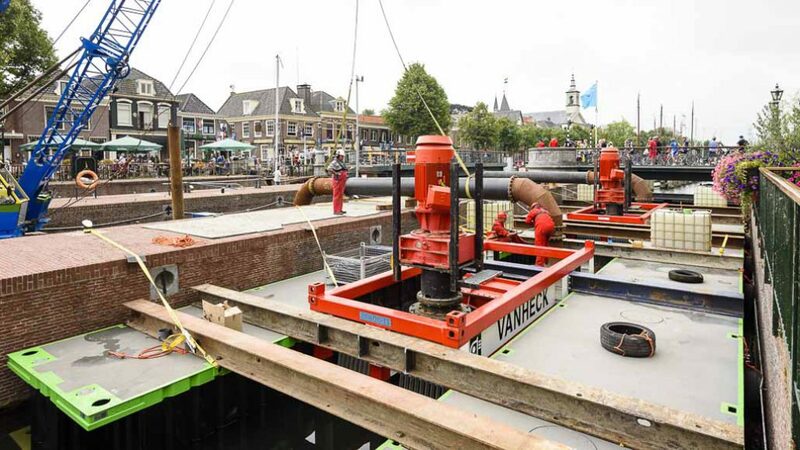 Three electrically driven VP800 pumps were installed in lock of the Groote Zeesluis. Each pump can pump over 7,500 m3 / hour over the middle tongue of the lock. The doors of the middle chamber are closed on the IJmeer side, so the water flows into the Vecht. 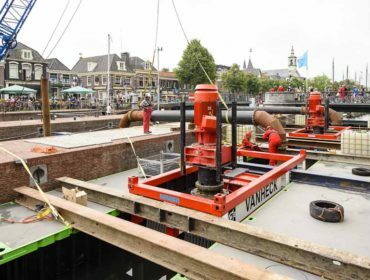 In order not to damage the locks built by Napoleon Bonaparte, Van Heck and Van Schie B.V. from Mijdrecht engineered a special plan to get the pumps into the locks. The large telescopic cranes or crane vessels that are normally needed to install the pumps could not be set up there. The solution: “just” make the 14 ton pumps float! By connecting two 40ft pontoons to each other and hanging the VP800 pumps between them, the pumps could floated into the lock. This way no damage was afflicted to either the bottom or the walls of the national monument. 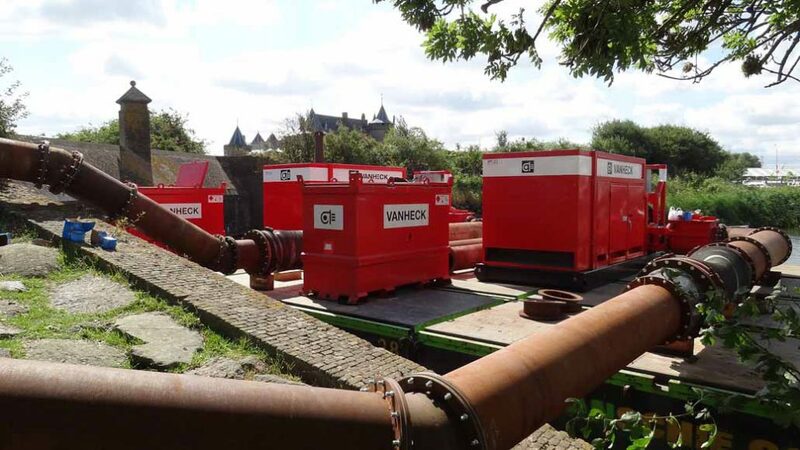 Via one of Van Heck’s modern control containers with three built-in frequency converters, the GenPower generators supplied power to our pumps. 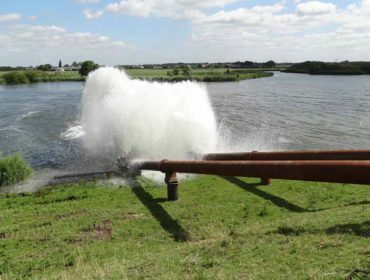 On Monday, this giant operation for our client Stichting Waternet was set in motion and Wednesday evening everything successfully operational. It is not the our largest project ever, but certainly a very innovative solution from Van Heck!